Earlier today was watching videos of Martin Taylor and found out that Stéphane Grappelli actually gave him one of Django's pick. 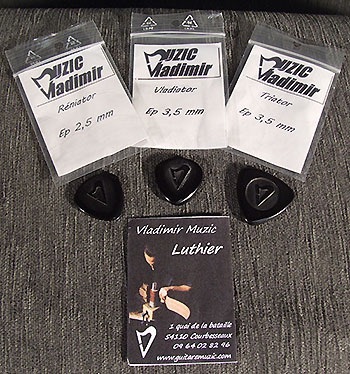 I think it would be really nice for me and all the other pick "nerds" if some manufacturer would try to reproduce this kind of pick. It looks pretty much like the various reports from people who had actually seen them have indicated. The Vladimir Muzic Triator looks similar, but Mr. Taylor would be the one to judge similarities in sound. That Djangojazz is waaay too heavy. I think it's unlikely that his actual pick was 6mm. But knowing that he would play with anything, maybe. I love the shape but they refuse to make it thinner. I bought this pick at Django in June this year. It's a beast! I find it to be great for rhythm. A little clunky for leads though. Truthfully, I don't use it much. It's a cool pick, but I think I may have bought it just to feed my pick addiction, and out of curiosity to see what the man himself used. And at $40, it isn't one that I leave the house with. All of the others they do, but this one they explicitly state they won't make it in any other size. At least that was the case last time I looked. I'd love to get it in 2mm size.